I am horizontal after an exhausting but wonderfully flowery weekend. It’s been all hands on deck at St James’s church in Fairburn since Friday to fill our pretty little church with this……!!! Our flower festival has been going on all weekend. There was a lot of work and a lot of fun and at the end of it all a fantastic result….then the cakes came (loads of them …..) and the kettle went on and the visitors came and no matter what the weather threw at us or our bunting we carried on and had a great weekend. One of the highlights was the miniature garden competition. You can see some of them bottom right of the main photo. 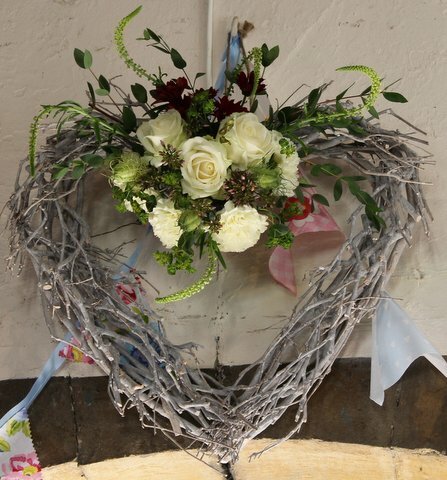 The children at Fairburn School had really put their hearts and souls into designing and creating lovely little gardens and our Judge had trouble coming up with winners, but rosettes were awarded and one of the little boys was first into the church on Saturday morning to see if he’d won. His garden was 3rd so he took photos and was obviously delighted – so much so he was back again today with his Dad and brother to show them too. I’m always amazed to see some of the creations and fascinated by the ideas for designs. This one, Farming Memories of our Parents comes from a farmer’ wife and daughter. All the elements were there, the wheat and the corn, wool from the sheep, willow hurdles and sunflowers with photos of both their fathers reminding us of another time. A beautiful composition and evocative of a golden age. ic lazy summer’s afternoon in the sun, chatting and eating and drinking and laughing….if only we could truly have a few days like that this summer…. We had a lot of fun as well. We worked pretty hard to make the church look this great and to get everything in place, but we chatted, we laughed and we enjoyed making it a success. 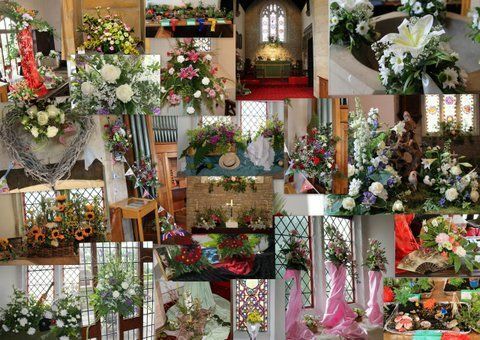 It was the first flower festival in a while at St James’s but hopefully it won’t be the last. Thanks everyone who worked so hard to make it a success, and thanks everyone who came and supported us – see you again next year? I hope so.